Capo ad from the late 1890's. US patent in 1897 by Lincoln Utt. The bar is a rubber roll with a "yielding or flexible core or spindle". 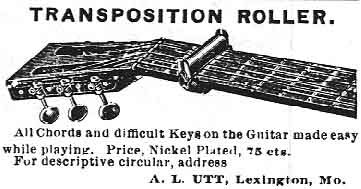 This indicates that curved fretboards were in use at the time. Tension is created by a coil spring. 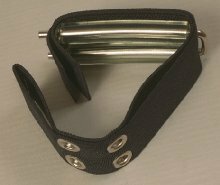 Between the back of the neck and the spring is a thin metal plate, either for neck protection or easier sliding. The spring is held in place by outward bent ears on the plate. You can see the slotted ends of the plate on each side of the roll. Unknown capo. It seems to be a real laquer scraper, but maybe the neck was protected by a pad. 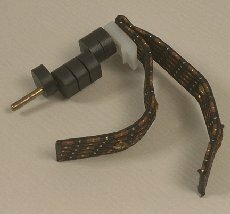 The coil spring is stretched by a lever, just like an old ski fastening. Very thick rubber pad. English patent 1927 by A D Keech. 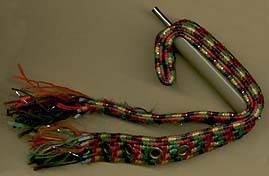 Capos of this type have a coil spring around the neck. They were marketed as banjo/ukulele capos. The spring force was probably not sufficient for more than four strings. To protect the finish of the instrument neck, the users often put some tubing around the spring. Cork pad. Made by Elton. A similar capo was made by Moment. Cork pad missing. The spring is fastened to square metal loops. You can see the remains of a handle on the left side of the bar. This is probably a development from the original patent. This capo has a rubber rolling bar. The L-shaped handle has an inverted key-hole that fits the end of the bar. Made by Keech. 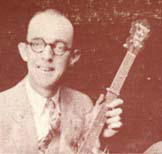 Jimmie Rodgers using a capo of this type. Picture taken in May 1927. Elton copy made by Arkansas Red. If you look at any of the old Pete Seeger albums or Kingston Trio albums the Elton capos they are using have the "red hot water bottle tubing" on them. This is more tradition than anything else. All the 60's long neck banjo folkies used the red hot water bottle tubing. The tiny "ribs" on the tubing make the capo slide up and down the neck without any jerky hangups. Nick Reynolds, who played tenor guitar with the Kingston Trio said he had used surgical latex tubing, but it didn't last, so one day he cut a piece from his mother's enema bag tubing and it worked so well he kept using it. Pete Seeger, in his book How To Play The Five String Banjo, says to use shower hose tubing, but when questioned about it, he said that was a misprint, and that "hot water bottle tubing" was what he meant to say. US patent 1931 by William H Russell. I think that this is the greatest capo invention. Almost every capo user has had one. Standard elastic capos with eyelets. the bridge and the tailpiece, and it will work as a mute! 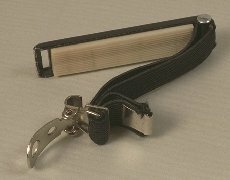 Elastic capo with heavy double straps. The straps used to have metal fittings at the ends to prevent them from looking like this. This one has double bars. Instead of eyelets this capo has a buckle with a hook and a string handle. The original elastic had the same color as the string. Oversized metal bar with a large grooved rubber pad. This capo is shown from another point of view above the menu. Buckle with hook and metal handle. Tin bar. There are tiny grooves along the pad. Here the hook and handle has developed into a lever. When the hook is attached to the end of the bar, the handle is flipped over to the top of the bar to get extra tension. US patent 1980 by Lyle F Shabram, Jr. This is a special capo with turnable rubber disks for fretting individual strings. Next to the strap is a nylon support for balancing the capo when few discs are used. Using one or more capos you can form chords, thus emulating open tunings without retuning the guitar. This is called partial capoing. Scales and closed chords are not altered. Check it out on Third Hand Capo. This idea was utilized for a mountain dulcimer capo. US patent 1986 by Swany D Cornette. Designed for quick key changes. Both the bar and the neck protection are rubber rolls. US patent 1991 by Jay S Kaufman. This is a development of the coil spring capo for quick key changes. Instead of rolls, the tubing around the bar and coil spring, is made of low friction material. The bar is springy to adjust to fretboards with different radii. The adjustment screw is threaded into the coil spring. The Quick Draw was upgraded in 2000. The head of the adjustment screw is changed to a ring that slips over the end of the bar. The coil spring is now hinged to the bar. Manufactured by Kaufman Music Accessories. Brittish patent 2001 by Martin Thorne & Martin Furey. 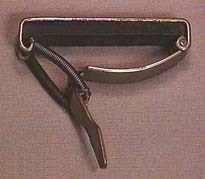 A chord forming capo for partial capoing. Made of brass. The ends of the fingers are flattened on to which is pushed slotted rubber blocks. The fingers are locked by the small screws on top of the bar. The ends of the bar are spring loaded. When attaching the capo you first pull the ends apart and clamp the capo to the sides of the fretboard, then you tighten it with the moulded rubber strap. Marketed by Varichord Co.